Though the ancient Oscan city of Pompeii, founded before the 6th century BC, had its ups and downs, by the AD 1st century it was a Roman colony of 20,000 and a thriving, bustling seaport. It occupied a prime stretch of coastline southeast of Neapolis (Naples), just on the other side of that huge mountain called Vesuvius. After 14 years of hard work, Pompeii was just getting back on its architectural feet following the massive earthquake of AD 63. The columns of the forum had been re-erected, and villa owners had piled lime next to the last walls that needed replastering. They thought the worst was over. At noon, August 24, AD 79, the peak of Mt. Vesuvius exploded, sending a mottled black-and-white mushroom cloud 12 miles into the air at twice the speed of sound, raining ash and light pumice down on the region. 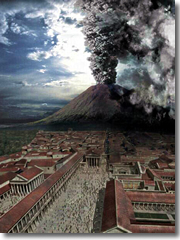 For 12 hours, the sheer force of the eruption kept that cloud aloft, and the lucky one among the Pompeiians fled. The more than 2,000 people whose bodies have been uncovered at Pompeii must have thought the enormous cloud hanging over Vesuvius was just smoke, for they stayed to sit it out. Then, the cloud collapsed, and the horror engulfed the city before anyone could run more than a few feet. 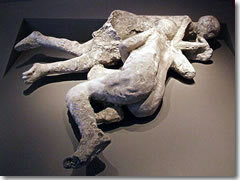 Pompeii was buried by a pyroclastic flow, a superfast rush of hot ash and pumice with an undercurrent of rock and burning gasses, all of which came barrelling down the mountain like a tidal wave, the force ripping the doors and roofs off houses, fusing metal house keys to skulls, and dismembering human bodies. "Though our carts were on level ground, they were tossed about in every direction.... The sea appeared to have shrunk, as if withdrawn by the tremors of the earth...and many sea creatures were beached on the sand. In the other direction loomed a horrible black cloud ripped by sudden bursts of fire, writhing snakelike and revealing sudden flashes larger than lightning. [W]e were enveloped in night—not a moonless night or one dimmed by cloud, but the darkness of a sealed room without lights. Some wept for themselves, others for their relations. There were those who, in their very fear of death, invoked it. Many lifted up their hands to the gods, but a great number believed there were no gods, and that this was to be the world's last, eternal night." —Pliny the Younger, describing the panic in Misenum, a town on the far side of the bay from Vesuvius, during the AD 79 eruption. The 17-year-old Pliny the Younger was across the bay at the time, and he described what he could see of the catastrophe—including "a cloud of unusual size and appearance...like an umbrella pine"—in a letter to the historian Tacitus. His uncle, the famed writer Pliny the Elder, fared worse. When he saw the volcano go, he took some boats to try to evacuate friends from a village on the shore below the mountain. The elder Pliny dictated his impressions to a scribe as they sailed, but the great author succumbed to the poisonous gasses while ashore and suffocated. Pompeii was not buried entirely; in fact the top floors of many houses poked above the new ground level. But between survivors returning to dig for personal belongings, the inevitable looters, and later farmers plowing their fields over the site, these building tops where shorn off. Within a few generations, incredibly, Pompeii was forgotten. In 1594, the architect Domenico Fontana was building an aqueduct through the area when he struck the ruins of Pompeii quite by accident. Most of the excavations have been carried out since the 18th century. The archaeological site is now enclosed, and takes a good, full day to explore. At the very least, it takes three to four hours to pop into the major sights. The roads are made of stone slabs, rutted deep with centuries' worth of wagon wheels. At most intersections are crosswalks of raised stepping stones—so citizens wouldn't have to step in the mucky, muddy streets. Besides the public buildings and mansions I'll highlight below, Pompeii is full of buildings that may be more pedestrian, but are just as fascinating for the insight they offer into daily life in an ancient Roman city. Poke around to find the shops with counters still in place and paintings describing the wares sold, bakeries with millstones and brick ovens in the backyard, even fast-food parlors with deep bowls set into the counters where prepared food were kept hot. The Forum at Pompeii.A few blocks up from the entrance and you'll stroll into the Forum, the central square of any Roman city. Around the edges you'll see that there was once a two-story colonnade, its 470-foot length oriented so that, ironically, "scenic" Mt. Vesuvius serves as a natural backdrop. At the northern end of the eastern edge is a small room with a countertop embedded with bowl-shape depressions of increasing sizes. The Forum was also a central marketplace, and to forestall arguments between buyer and seller, these were used as the city's standards of measure. Just past the measuring table is an enclosed building in which you'll see plaster casts of bodies. During the early excavations, archaeologists realized that the ash had packed around dying Pompeiians and hardened almost instantly. The bodies decayed, leaving just the skeletons lying in people-shaped air pockets under the ground. Holes were drilled down to a few and plaster was poured in, taking a rough cast of the moment of death. Some people writhe in agony. A dog, chained to a post, turns to bite desperately at his collar. One man sits on the ground, covering his face in grief. Exit the Forum onto Via dell Abbondanza, detouring left down Via del Teatro to see the Teatro Grande, a 2nd-century BC theater that could seat 5,000. Under the stage lay a reservoir so that the scena could be flooded for mock naval battles (some suggest the water also helped amplify the acoustics during performances). Nearby on Via Stabiana is the Odeon or Teatro Piccolo, a much smaller theater (seating 1,000) used mainly for concerts. The House of Menander has painted scenes from the Trojan cycle in some rooms, and a floor mosaic of the Nile in the peristyle (the family who lived here were all found together, huddled in one room, killed when the roof caved in on them). Past the intersection with Via Stabiana, long Via dell Abbondanza marks the site of the "New Excavations," undertaken since 1911. Many of the houses on both sides of this street retain their second stories, and while those on the north/left side haven't been excavated much beyond the facades, those on the right have and—unlike in much of the older, more famous excavations (north of the Forum; we'll get there in a minute)—as many of the frescoes, mosaics, and statuary as possible have been left in place rather than shipped off to a museum. Bodies from the final moments of PompeiiAmong the houses along this street, be sure you pop into the House of D. Octavius Quartius, with lots of good frescoes and replanted gardens; and the House of the Marine Venus, with a large wall painting of the goddess stretched out on a clamshell. Near the end of the street, turn right to walk through the Great Palestra—a huge open space shaded by umbrella pines where the city's youths went to work out and play sports (many came here seeking shelter from the eruption; their skeletons were found huddled in the corner latrine)—to the Amphitheater. Built in 80 BC, this is the oldest amphitheater in the world, and could hold 12,000 spectators who, according to the records, were just as wont to break into a brawl in the stands as watch the gladiators fighting on the field below. Return down Via dell Abbondanza to Via Stabiana. On the northwest corner sit the Thermae Stabiane, a series of baths with stuccoed and painted ceilings surviving in some rooms and a few glass caskets with more twisted plaster cast bodies of Pompeii victims. Head up Vico del Lupanare on the other side of these baths to the acute intersection with the overhanging second story, the Lupanar. This brothel left nothing to the imagination. Painted scenes above each of the little cells inside graphically showed potential clients the position in which the whore of that particular room specialized. Until a few decades ago, only male tourists were allowed in to see it. Down in modern Pompei, you can take an elevator 265 feet up the cathedral bell tower (entry off the church's left aisle and through the gift shop) for a view across the ruins of the nearby archaeological park to Vesuvius, including an excellent bird's-eye view of Pompeii's amphitheater in the foreground. It's open Saturday to Thursday 9am to 1pm and 3:20 to 6pm (5pm in winter). Continuing north to the heart of the Old Excavations, be sure to stop by the House of the Vettii, one of the most luxurious mansions in town (it belonged to two trading mogul brothers) and in a wonderful state of preservation. Behind a glass shield at the entrance is a painting of a Priapus, a little guy with a grotesquely oversized male member—here shown weighing the appendage on a scale. Some frescoed chambers—like this one at the Villa dei Misteri—survived the ages intact.This was not meant to be lewd, but rather was a common device believed to ward off evil spirits and thoughts. Painted putti and cherubs dance around the atrium while the rooms are filled with frescoes of mythological scenes and characters. Don't miss the "Sala Dipinta," where a black band around the walls is painted with cherubs engaging in sports and in the various trades in which the Vettii probably had investments. Though the House of the Faun is huge and famous, most of its treasures were long ago shipped off to Naples' Archaeological Museum, including the Alexander Mosaic and the namesake bronze statue in the atrium's fountain (here replaced by a copy). The House of the Tragic Poet is closed, but between the bars of the gate you can still see the most famous mosaic in Pompeii: a fearsome chained dog with a spiked collar and the epithet Cave Canem ("Beware of the Dog"). The nearby Forum Baths retain ribbed stucco on some ceilings and a strip of tiny telamons along one wall. Walk north along Via Consolare to exit the ruins (hold on to your ticket) and follow the path for five minutes to the suburban Villa dei Misteri (Villa of the Mysteries), which you get into on the same ticket. Built around the 2nd century BC, this villa was converted into a center for the Dionysian cult, and the walls are gorgeously and skillfully painted with life-size figures engaging in the Dionysian Mysteries of an initiate (though these paintings have helped modern scholars guess at the nature of these rites, we still don't know exactly what was involved). The scenes play out against a background of such deep, intense red that the color used is still called "Pompeiian red." Grab an audioguide at the entrance for €6.50 (two can share one for €10). There's even a kiddie version written for youngsters (at last check it cost €4). With these, you can either follow one of several set itineraries, or just use it on a sights by sight basis as you wander through the ghost city, punching up the background info on just the bits that interest you. If you have a large family or small group, you may want to splurge on hiring a registered guide. Groups of 8–25 people pay around €100 (2008 prices). I recommend Gaetano Manfredi (www.pompeiitourguide.com; gaetanoguide@hotmail.it or 3387255620@tim.it)—though he's in high demand, and actually now has imposters posing as him (odd form of flattery). Call him directly at tel. +39-081-863-9816 (though it's easier to reach him on his cell phone: tel. +39-338-725-5620). 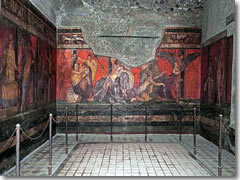 Traveling to Pompeii en route elsewhere? The bar in the train station will let you leave your luggage for a small fee until 6pm. From Naples, take the half-hourly private Circumvesuviana train (» more) toward Sorrento and get off at "Pompei Scavi-Villa dei Misteri" (27–40 min.). En route, this train passes through Ercolano (17 min.). This half-hourly Circumvesuviana train also runs to or from Sorrento (20 min.). Turn right out of the station, and the entrance to the Pompeii archeological site is just a few hundred feet down on your left. Continue down this road to enter the modern town of Pompei after about ten minutes. Don't want to bother, or simply want to take a Pompeii day trip from Rome? Look into taking a direct shuttle, or go with a group bus tour through Viator (www.viator.com)—which offers both a Pompeii-and-Naples day trip from Rome as well as a popular Pompeii-Amalfi Coast trip—or some outfit like Enjoy Rome (www.enjoyrome.com) or Green Line (www.greenlinetours.com). It'll take all day and include lunch. Expect to leave early (around between 6:30 and 7:30am) and not be back in Rome until between 7pm and 9:30pm. For a quick lunch, on either side of the site entrance you'll be wooed by a phalanx of orange-wielding panino stand owners trying to sell you an overpriced spremuta (fresh-squeezed juice) or soggy sandwich. Actually, the food truck parked directly across from the ruins’ entrance is the best of the lot, offering huge panini stuffed with tasty fresh ingredients plus a drink for under $15. Among the countless glorified pizza joints with polyglot menus on modern Pompei's main drag, Zi Caterina stands out for its solid cooking and reasonable prices. Not that it's not still touristy—anything near the ruins in Pompei is guaranteed that—just that it's a cut above the rest. The cavernous single room, antiqued with lots of wood, can get noisy as it fills up and the strolling troubadour starts strumming his guitar. The delicious risotto alla pescatora is heavily laden with shellfish, calamari, and shrimp, and the gnocchi alla sorrentina is also good. Secondi tend to be fishy as well, with a beach platter saute di frutti di mare (clams, oysters, and mussels) or baccalà (dried salt cod), but landlubbers can always order coniglio alla cacciatora (rabbit stewed with tomatoes and mushrooms). Via Roma 20. tel. 081-850-7447, or 081-863-1263. www.zicaterinapompei.it. Closed Tues.
Hotel Villa dei Misteri [€€] - This remains the bland roadside inn of choice for die-hard archaeology buffs who want to sleep a stone's throw from the excavations (the entrance is a two-minute walk downhill). Once you get past the cement bunker exterior, the 40 balconied and amply sized rooms are pleasant enough, with shiny new tile floors, well-worn but serviceable furnishings, and recently overhauled baths (although they forgot to install a place to hang the hand-held shower nozzles). The mattresses, however, still rest on lazy-springed cots. But the A/C and statue-ringed pool (open late May to October) do wonders for its appeal, especially after a dusty and exhausting day in the ruins. A walkway suspended above the pool leads to the decent but unmemorable restaurant, and there's a TV lounge with small bar area for mingling. Via Villa dei Misteri 11. tel. 081-861-3593. www.villadeimisteri.it. Doubles €65–€79 (Breakfast €5 per person); From €54 online. 1/4 mile from site entrance and train station; turn left upon exiting station. Planning your day: Pompeii takes a good, full day to explore. At the very least, it takes three to four hours , minimum, to pop into the major sights (it's a city, remember, so there's a lot of walking to be done).. Visiting both Herculaneum and Pompeii? Admission to each costs €11 and is good for only one day, but you can also buy a combined ticket for both (plus three other ancient sites in the area) for €20 that's valid for three days. Especially on weekends (they average 4,700 visitors a day, up to 22,000 people on holidays). Alongwith a brimmed hat, and sun block—it's hard to escape the sun at Pompeii, and the dust is everywhere. The map the ticket office hands out is pretty good for finding every site in the ruined town, but Pompeii is one place where investing in a nice guidebook full of color photos at the gift shop before you explore is worth your while to get detailed background. The ticket booth at the archaeological site will give you the free map and all you really need to explore Pompeii. There's also a tourist office in modern Pompei at Via Sacra 1 (tel. 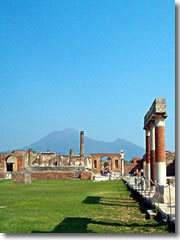 +39-081-850-7255; www.pompeiisites.org), open Monday to Friday 9am to 2:30pm, Saturday and Sunday 9am to 2pm.